Organizations generate colossal amounts of data every day. However, only a handful of them are able to harvest useful information. Why only a handful, because these organizations follow a business intelligence strategy that harnesses knowledge. Enterprises and organizations that are able to integrate a business intelligence strategy have a competitive advantage. Such enterprises do not focus only on traditional reporting and/or analytics but on predictive analytics to deliver robust products and top-line. For today’s enterprises and organizations, hunches and experience, that mid and senior level management brought to the table, have been replaced with logical frameworks and business strategies. If yours is a business that competes in the Fast-Moving Consumer Goods (FMCG) industry, you are facing a constant challenge of expanding portfolios, ensuring regulation compliance, reporting requirements, and managing a multifaceted supply chain that has distinct requirements. Unlike the other industries, the FMCG industry relies heavily on accurate and prompt market research, which can be used to run effective marketing campaigns. Along with these, any enterprise in this industry needs a well-organized distribution network coupled with an effective sales force to implement strategies and be intelligent enough to iterate quickly if targets are not met. The competition in the FMCG industry today adds various components to consolidate their position in the market, create new sales channels and growth opportunities, while increasing the efficiency of their supply chain. 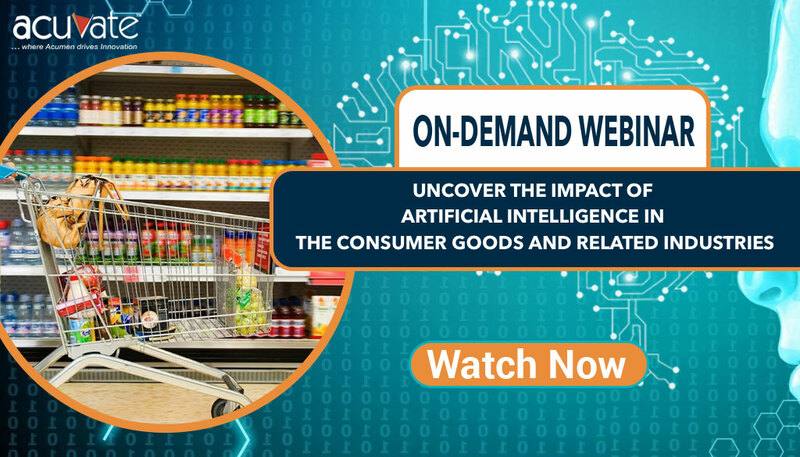 To compete in such an environment, FMCG companies should leverage an authoritative grouping of business intelligence, technology and management to be able to compete and win market share. What are the major changes in the FMCG industry? The FMCG industry has evolved greatly. With the average income of working professionals increasing the craving that customers have towards global products has increased tremendously. Due to this appetite, the consumer is in a position to demand for not just global products but quality ones as well. It is safe to say that the industry has witnessed an explosion of products along with a diversification of markets as well. This phenomenon has increased: innovation, entry of new players, and process capabilities of industry players. Bottlenecks caused by external and internal issues have caused the industry in general to suffer. Therefore, to adapt to these blockages, enterprises have tried to adopt various tactics but to no avail. How can FMCG companies address the issue? Secondary Sales: the sales the distributor/retailer makes by selling the same goods to the consumers/end-users. While the primary revenue is what comes on the balance sheet of FMCG companies, the secondary revenue is the sales of all the retailers and distributors, which is the accurate view of the product performance. This will be a crucial aspect that FMCG companies need to track. The focus is to ensure that existing products are made available to every consumer of the target segment and are consumed well – leading to higher sales. This will ensure that the secondary sales figures are higher, creating a pull for primary sales. How can FMCG companies achieve this? Now that we know what to address, there comes a problem of gathering information. Business intelligence solves this specific problem for enterprises. What does a Business Intelligence Strategy solve for Your enterprise? Determining the ROI for your marketing strategy. Ensuring you spend the right amount at the right place at the right time. Identifying new segments to target. Optimizing spend, based on the BCG Matrix. Providing insights on determining the best promotional strategies which yield maximum results. Bettering your marketing and sales strategies. Increasing sales by improving operational efficiencies by driving better OTIF and MSL compliance. Identifying the ROI on the shelf expenditure for each individual retailer. Understanding your market share and competitor performances better. Helping you analyze the performance of new product launches relative to other compete products. Part of the BI strategy involves improving operational efficiencies. This is done primarily across field sales teams and supply chain teams by measuring the following parameters. Must Stock List: Based on the marketing campaigns and the forecasted sales, it is crucial to keep your stockpiles updated, as end-consumers, at the retail point, might choose your competitor’s product due to non-availability. One critical aspect to increase sales is product availability at the outlets and making sure that these outlets have the required stock and are displaying your products. Based on the promotions being run and previous sales, field sales teams would try to ensure that the products that are being promoted or are in high-demand, based on sales history, are present at all the retail outlets. Effectively, these teams make sure that no opportunity is lost for the company. Ensuring this increases secondary sales and helps in creating an upstream demand and increasing the primary sales of the company. On Time in Full: ‘Every order received needs to be serviced on time and in full (OTIF),’ is common knowledge across FMCG companies and distributors. Companies try to master it but due to various bottlenecks, such as stock not being available at the warehouses, trucks not being available, truck loading efficiency, etc. orders cannot be fulfilled in time and in full. This also creates differences of opinion with the retailers for non-availability of products – impacting secondary sales and forcing them to look for alternatives to service end-consumers. This directly affects the primary sales and also benefits your competitors. Artificial intelligence helps in improving OTIF loss by looking at the regions, products or reasons causing these inefficiencies. The sales and supply chain teams can work to fix these inefficiencies so that none of these opportunities are lost and increasing the primary sales revenues. With BI, you can forecast OTIF losses based on the sales forecast, actual secondary sales, and production capabilities. You can determine how to avoid these losses either by increasing production, decreasing marketing budget or improving your supply chain. Having these will help teams across your organization access critical information with ease. Information would be available at their fingertips – therefore more time can be spent in strategizing ways to improve your company’s top line. A self-service BI helps teams take decisions based on the insights without having to depend of developers or MIS teams. BI systems can even send out alerts if KPIs go above and beyond a threshold. Dashboards in the BI system helps keep track of all the stockpiles for various retailers and distributors. What do you think about the blog post? Was it helpful? Share your thoughts and suggestions by commenting below.